Just days after a deadly fight against Link Joker that involved the whole world,everything is peaceful and the usual calm days have came back. 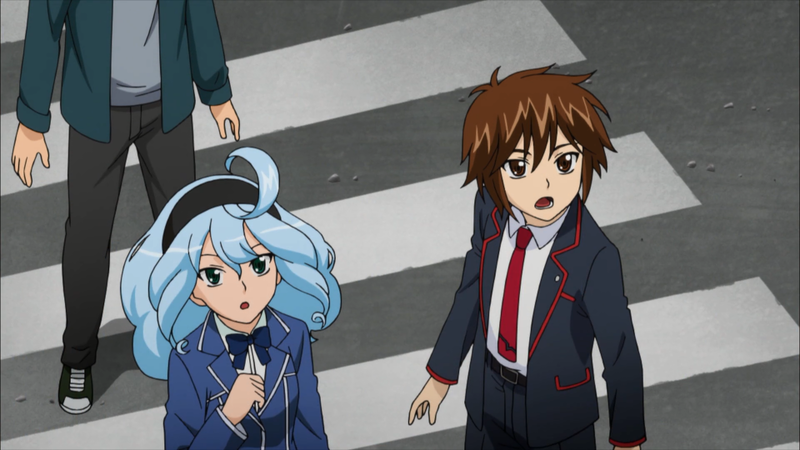 But, Kai Toshiki faces a surprising situation. Sendou Aichi, the hero who saved the world from the invasion of Link Joker, suddenly disappeared. Along with peoples' memory of his existence…While there are few clues to go by, Kai will seek Aichi with only the proof of their bond, “Blaster Blade” and a Royal Paladin deck. Fighters named the “Quatre Knights” appear before Kai. 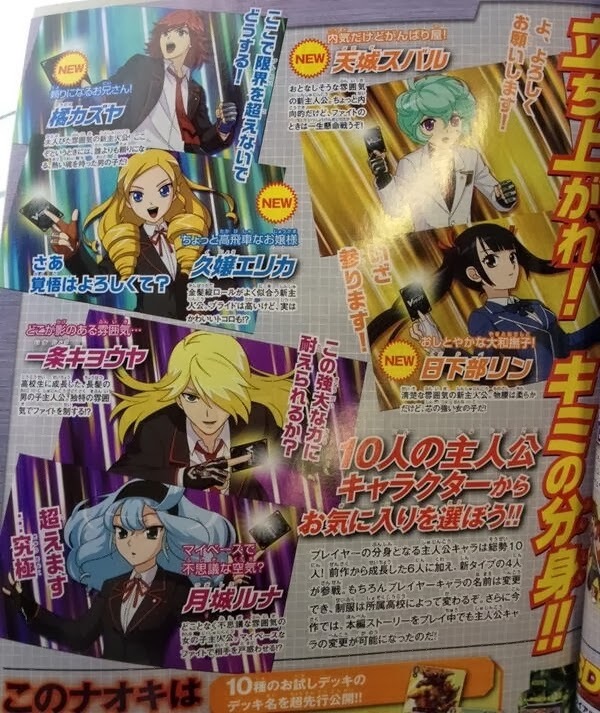 The four fighters—Gaillard, Neve, Ratie and Serra—are world class fighters in Vanguard. They use a mysterious power and tell Kai to give up seeking Aichi.What is their purpose…?! And what is their relationship with Aichi…? 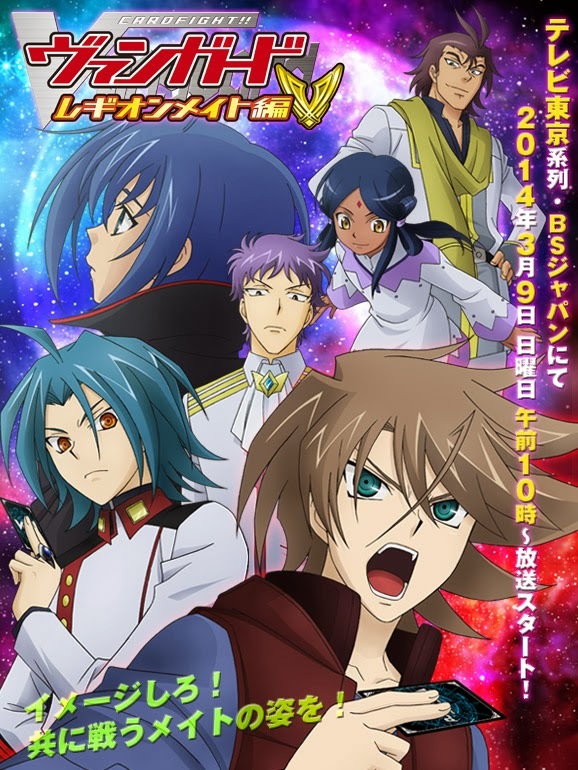 !Receiving the new power "Legion," Kai's fight to get Aichi back, starts now!! The commercial for Legion Mate showed Kai's role as the protagonist prominently, featuring him alongside the surviving Team Q4 members, as well as Naoki, Ren and Miwa. Naoki and Kai's new friendship has been emphasized in the commercial, while a poster for the series seen above features the antagonistic Quartre Knights, each of which appears to be a counterpart of a member from Q4. 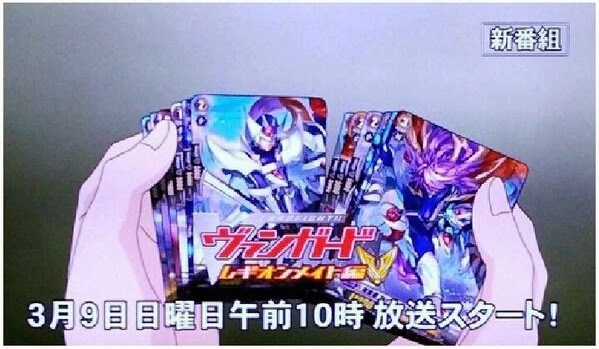 Another image from the commercial gave early details on some of the cards from TD14: Seeker of Hope, revealing that Blaster Blade Seeker will be a grade 2 with 9000 power and 5000 shield, and that Sacred Wingal will be a base 11000 power grade 3. Legion Mate is set to air on March 9 in Japan, exactly one week after Link Joker ends on March 2 this weekend. 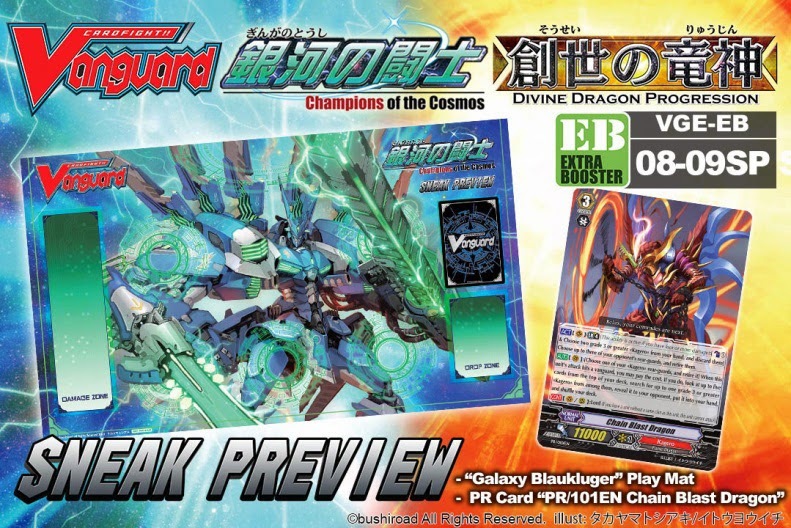 In international news, two extra boosters were confirmed for an English release today, with VGE-EB08: Champions of the Cosmos and VGE-EB09: Divine Dragon Progression getting a dual release on June 6, 2014. The primary draws of EB08 are its crossride units Immortal Asura Kaiser and Galaxy Blaukluger, along with the legacy support for the old cards that they bring. 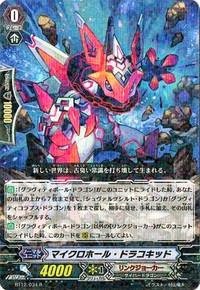 Since Champions of the Cosmos' Japanese release last November the Galaxy Blaukluger deck has gradually climbed up the ranks of VGCS tournaments to become the dominant competitive option for Nova Grappler, much as the original Blaukluger had back in 2011. 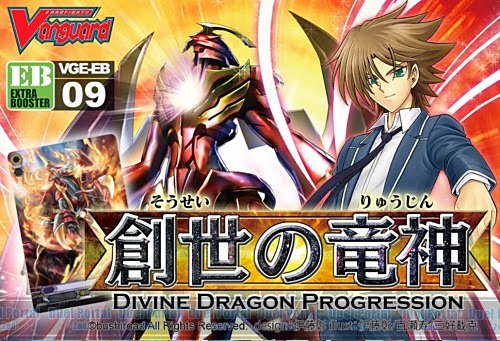 Divine Dragon Progression is based around the cards used by Kai Toshiki in the more recent volumes of the manga and is the better known set by far, chiefly for the infamy of its cover card Dragonic Nouvelle Vague. As the first fully implemented grade 4 unit, Nouvelle Vague's designers are held to have overcompensated for its unwieldy nature with extensive options for deck searching and field control, and skills that both prevent it from being guarded with grade 0 units and passively nullify the opponent's trigger checks. These qualities were not in the card's original intention--Itou had envisioned Nouvelle as nullifying both players' trigger checks and not having the Twin Drive!! ability--and have snowballed along with Kagerou's self-standing break ride support to create a deck that can attack multiple times with its vanguard while preventing the opponent from guarding those attacks while also sitting on an unnaturally high 13000 base power and destroying the opposing rearguards to prevent them from fighting back. Nouvelle has thus superseded Link Joker in Japan as the dominant deck of competitive play, leading to the restriction of Lizard Soldier Conroe who was a major linchpin in the deck's consistency. The build is currently considered wounded but playable, as it has continued to dominate Japanese Vanguard Championships alongside Omniscience Regalia Minerva, accounting for up to 18% of all decks played in some cases. EB08 will feature a promotional print of Nova Grappler's original critical trigger, Shining Lady, with her 2011 anime artwork as a box topper, while EB09 will get a print of Dragon Dancer Arabella. 2/28/2014 Update: The Nova Grapplers will also be receiving a special Sneak Preview playmat that can be won by participating in the extra boosters' dual launch event. 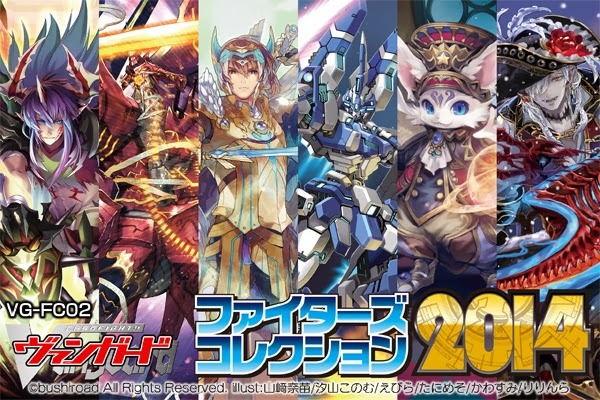 This time the playmat will be of Galaxy Blaukluger. Unlike with EB04 and EB05, there will be a second playmat representing the Kagerou side. Which unit will be featured is unknown but it is speculated to be Dragonic Nouvelle Vague. Those that take part in the Sneak Preview will also receive a PR/101EN Chain Blaster Dragon. Back in Japan, Chain Blast had been a Monthly Bushiroad promo, and was known for his ability to simultaneously retire three of the opponent's rearguards by discarding two grade 3 units with his limit break, while searching for those grade 3s with his non-limit break skill. Sneak Preview events will be taking place around the world on May 30, May 31 and June 1, with the final dates determined by the hosting store. In other news, VG-BT15: Infinite Rebirth officially released in Japan today. While there was some trouble with international sellers in Singapore stocking the set before the street date, the surprises surrounding the set were limited this time due to all of BT15's RRR and RR-rarity cards being known from promotional materials released ahead of time. What is drawing the most attention at this time is that the newly released Triple Reverse rarity card, Star-vader “Ω” Glendios, is now selling for as high as 6000~8000 yen (approx. $60~$80 in US money) higher than any other single card in the history of the game, including its immediate predecessor Chaos Breaker Dragon who sold for as most as a Japanese booster box at release. 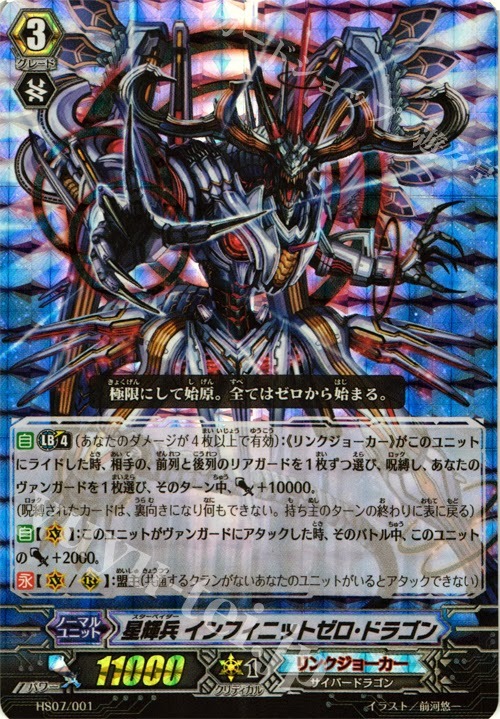 Although Link Joker usage has waned considerably since the release of Dragonic Nouvelle Vague in Japan, Glendios has gotten particular attention not just for its unique rarity but also due to the host of supporting units that have helped it along, in particular Cold Death Dragon and “Яeverse” Cradle. Glendios' core strategy is built around its alternate win condition, having all of the opponent's rearguards Locked at the beginning of its cardfighters' main phase while also having five damage, but requires repeatedly discarding “Я” cards to use its highly defensive Omega Lock ability that prevents cards from opening during the end phase. The disadvantage to this is that prior to “Я” Cradle, all Reverse cards came from other clans and Glendios could only make Reverse cards already on the field into Link Joker units, so the deck had a crippling weakness in that it was forced to run between 12 and 16 grade 3s with many of them being of the wrong clan and having the Lord skill that prevents them from attacking unless Glendios is on the vanguard circle. “Я” Cradle neutralized this by giving both a Reverse card to Link Joker so that only a limited number of cards from other clans would need to be used, and also sharing his ability to turn Reverse units into Link Jokers. Meanwhile Cold Death Dragon is a grade 2 that when called can put the top card of the opponent's deck into play Locked for counterblast 1, on the condition that they already have a Locked card. This makes it easier to achieve the deck's win condition as the opponent does not have the option of leaving some circles empty to prevent cards from being Locked. With the addition of Ruin Magician and Praseodymium, grade 1 units that can add Reverse cards back to the hand from the drop zone and unflip damage respectively, the Glendios build has evolved into an effective alternate strategy that has even secured independence from Infinite Zero Dragon, but some have criticized it as lacking interaction with the game compared to Chaos Breaker or Nebula Lord and shutting the opponent down too heavily to promote interesting gameplay. Los Angeles, CA (February 24, 2014) – Bushiroad announced their plans for their 2nd Cardfight!! Vanguard Team League series which will take place between April to July 2014. The Cardfight!! Vanguard “Team League” tournament series focuses on the team format. Players of all ages may form teams, consisting of 3 members, to face off against other teams. The key change between Team League 2013 and Team League 2014 is the featured Regional Championships across multiple countries between April to July 2014. These Regional Championships will lead up to the Continental Championships for each of the 3 regions (North America, EU, Asia-Oceania) in July 2014. Bushiroad will sponsor the travel and accommodation fees of most winning teams from each Regional Championship. For an immersive experience within the current Cardfight!! Vanguard narrative universe, players form teams to “protect” or “invade” their region during the Cardfight!! Vanguard Team League 2014. Teams who choose to protect are the “Cray Defenders,” while teams who invade are the “Void Invaders.” The results will be updated on Cardfight!! Vanguard’s website and Facebook page to reflect the progress of the campaign. The Cardfight!! Vanguard Team League 2014 will be held in conjunction with the “Neo-Showdown” and “Buddy Challenge,” which will be the first major English tournaments for Weiβ Schwarz and Future Card Buddyfight respectively. Producer of the English Edition Cardfight!! Vanguard and Weiβ Schwarz, and Co-Producer of Future Card Buddyfight, Shunichi Taira explained that the changes in the qualifying format were to cater to the growing communities for Cardfight!! 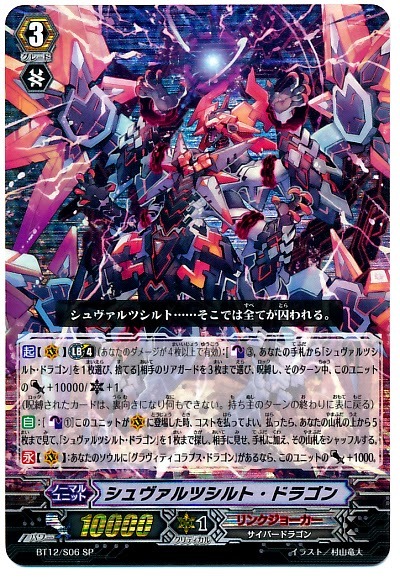 Vanguard, WeiβSchwarz and Future Card Buddyfight. “We are excited to have future major events feature all current English editions of our games. We will plan for these events to be held in multiple central locations around the world to cater to players everywhere”. Early this morning in Japan the card of the today profile for Dragonic Overlord the "Яe-birth" brought with it a special announcement. 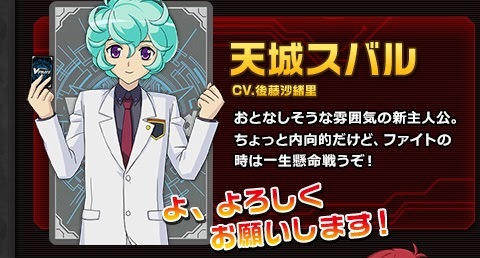 On February 28th, the "Unit Information" feature in the Japanese card of the day profiles will end, with card profiles being moved exclusively to Monthly Bushiroad magazine as "Unit Description Original Novels: Stories from the Planet Cray." In place of the card lores, on March 3rd the Today's Card section will instead feature "A Word from Vanguard R&D" discussing card mechanics and the design ideas behind cards. 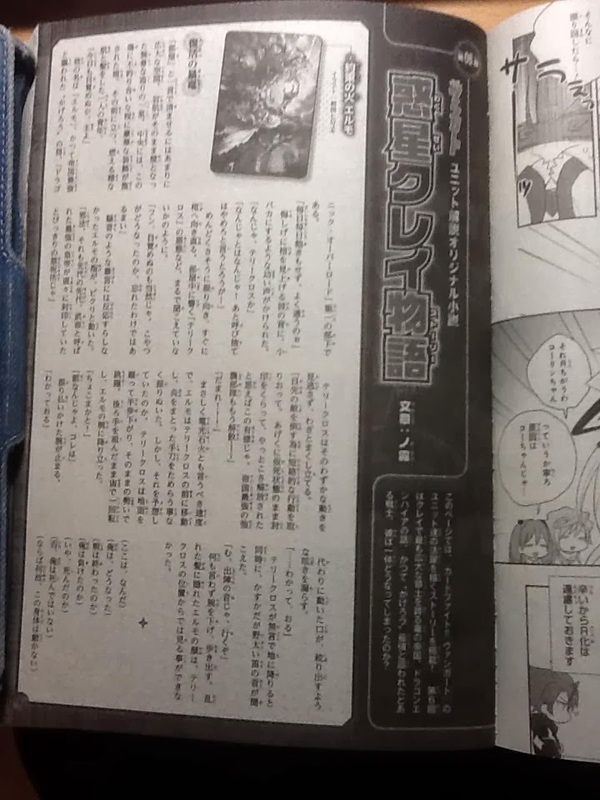 Monthly Bushiroad's most recent short story, page 1/3. The announcement comes as a major disappointment to international fans, and has been subject to strong criticism in the west. While the English-language equivalent column never included the "Unit Information" section, unofficial translations of the Japanese card profiles have been circulated since they first began in January 2011. 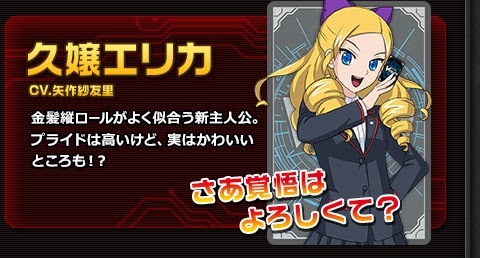 By dropping these lores from web circulation and moving them exclusively to Monthly Bushiroad--which until now had specialized in supplementary short stories about the units--the card game's narrative has been restricted to a much smaller readership of Japanese-literate consumers. 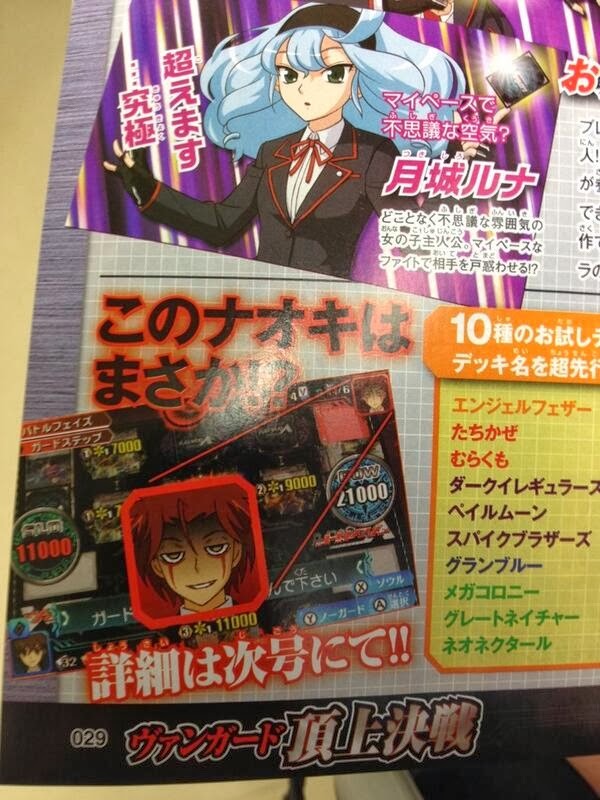 As Japanese fans rarely provide clear scans of Monthly Bushiroad, this may be the end of the card lore for the west. Overseas fans would have to purchase and scan issues of the magazine to make the lore easily available again. As Monthly Bushiroad is an anthology-sized monthly magazine with a short print run, and subscriptions to foreign publications are difficult to obtain in the United States without going through Kinokuniya, the task of acquiring and scanning each month's short stories is daunting. And because the lores are also longer and more detailed, and cannot be quickly transcribed for assistance from electronic dictionaries and machine translators, the translation will also prove considerably more difficult than before. The first booster set of Cardfight!! 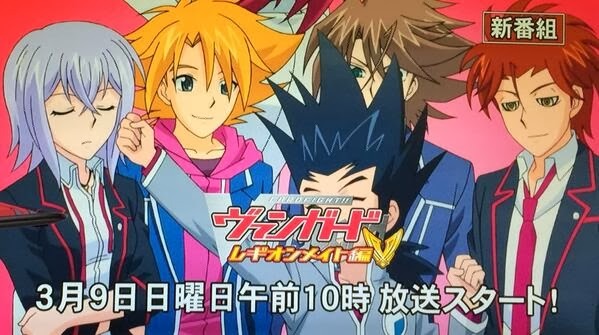 Vanguard's fourth season, Legion Mate, is scheduled to go on sale in Japan on May 16th. 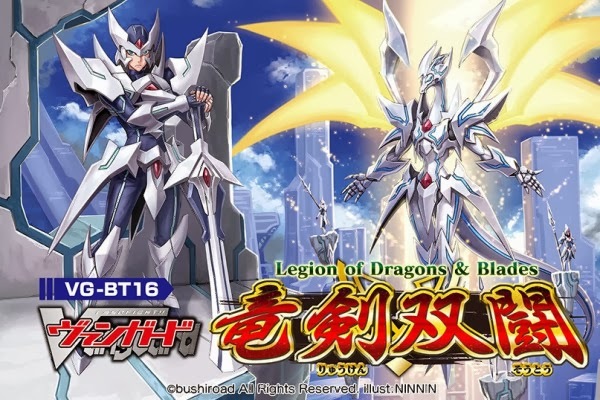 VG-BT16: Legion of Dragons & Blades (竜剣双闘 Ryuukensoutou "Dragon and Sword Fighting Together") will feature cards for the Royal Paladin, Narukami, Nova Grappler, Dimension Police, Spike Brothers and Neo Nectar clans, and will feature cards used by Kai Toshiki supporting the new "Legion" system. Additionally, BT16 will introduce a new rarity above or on the same level as Special Parallel, Legion Rare. The set size will be the same as BT09-BT15, 102 cards with 8 RRR, 12 RR, 22 R and 60 C cards, but with the addition of 2 LRs. The set will feature one reprint, thought to be Blaster Blade Seeker from TD14. 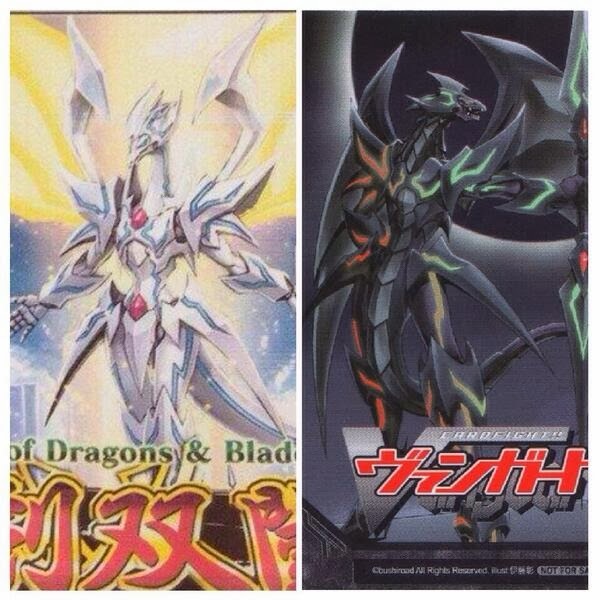 Like in Seeker of Hope and Brawler of Friendship, the cover art for Legion of Dragons & Blades is a single continuous piece, lending to the interpretation that its two cover cards will interact in a way similar to Blaster Blade Seeker and Sacred Wingal in TD14. 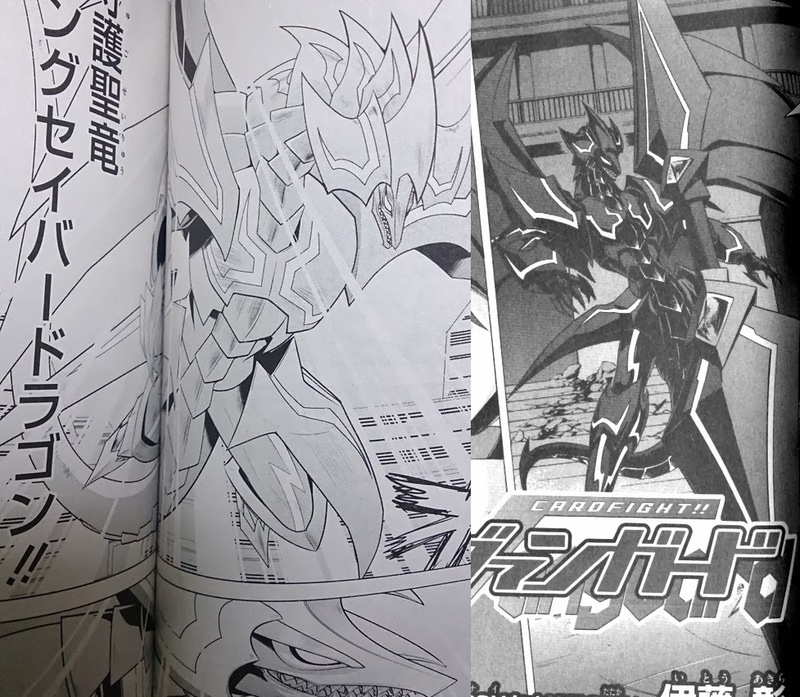 What has captured the imaginations of both Japanese and international fans alike is the cover dragon's resemblance to the boss card of the Shadow Paladin clan, Phantom Blaster Dragon, and his past incarnation from the Cardfight!! Vanguard Gaiden: Shining Swordsman manga. Although Phantom Blaster Dragon was known from the card lores as the former guardian dragon of the United Sanctuary, whose role was assumed by Soul Saver Dragon after his fall to darkness, prior to Gaiden his time as the guardian deity was not shown at length beyond being his motivation for trying to destroy the Sanctuary. Introduced as the "Guardian Saint Dragon, Sing Saver Dragon" (守護聖竜シングセイバードラゴン Shugoseiryuu Shingu Seibaa Doragon) his appearance was visually identical to his later incarnation save for being implied as a white dragon. This was before any kind of official design for Phantom as the guardian dragon had been established however, and Sing Saver's depiction came from Koshimizu Makoto rather than Itou Akira or any of the other more established artists within the franchise. While many assume that the cover dragon for BT16 is a new incarnation of Soul Saver Dragon, artist NINNIN--known for work on Phantom Blaster Overlord, Vowing Saber Dragon and others--has rendered the unit using Phantom Blaster's iconic tripartite horns, pauldrons and six wings. 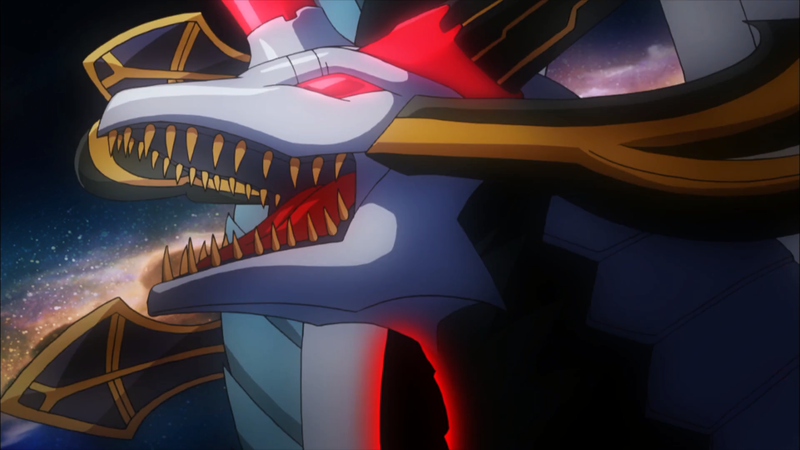 A similar borrowing of visual appearance was used for creating visual continuity between BT15: Infinite Rebirth's Dragruler Phantom, the most recent incarnation of the Blaster Dragon. This has led to speculation that Legion of Dragon and Blades will feature Sin Saver Dragon as its cover card, either dealing with the history of Cray prior to Phantom Blaster's fall and the civil war, or in some way restoring Phantom from his abyss dragon form. In other news, the official Cardfight!! 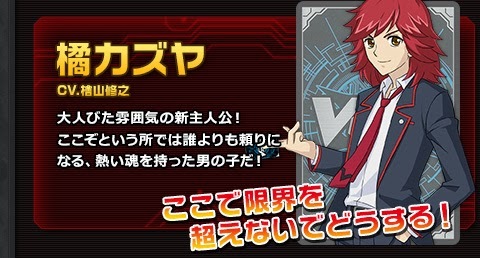 Vanguard Lock on Victory website has been updated with detailed character and deck information. Notably while the character section does feature most of the third season's core cast, none of their Reverse cards have been displayed among their key cards despite ample evidence that their Reverses will appear in the game. FuRyu is making an effort to keep the Reverse storyline under wraps for the player base. In addition to the anime characters, the website also features the returning six protagonists from Ride to Victory, along with four new ones. The new characters' profiles have been translated below. Tenjou Subaru/天城スバル voiced by Gotou Saori/後藤沙緒里 is a "quiet but energetic boy. He's somewhat introverted, but at his best in a fight." 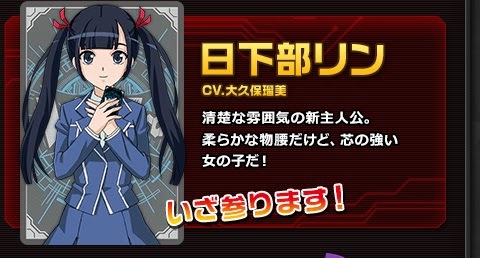 Kusabe Rin/日下部 voiced by Ookubo Rumi/大久保瑠美 is a "neat and tidy girl with a strong heart." "Now what will you do here, with limits you can't cross?" Tachibana Kazuya/橘カズヤ voiced by Hiyama Nobuyuki/檜山修之 is a "mature young man, dependable and with a burning soul." "So, have you prepared yourself?" Kyuujou Erika/久嬢エリカ voiced by Yahagi Sayuri/矢作紗友里 is "a girl with long golden rolls of hair. She's very prideful, but cute while she's at it." One mistake that did catch Japanese fans' attention is that Kai is mistakenly listed as a first year high school student in the character profiles, when in reality he's in his second year. (Under the Japanese school system, this is equivalent to a Junior in US schools.) Overall Erika and Kazuya have been the best received of the new protagonists with Japanese fans. Readers are encouraged to visit the Lock on Victory website, as an intense amount of foreign traffic may show international interest in an overseas release of the 3DS game. The cover characters for the fourteenth and fifteenth trial decks broke early this morning, confirming fans' initial speculations about the direction of the Cardfight!! Vanguard franchise's fourth chapter, Legion Mate. VG-TD14: Seeker of Hope features cards that will be used by Kai Toshiki in the anime, while VG-TD15: Brawler of Friendship will instead feature Ishida Naoki's units. The news was first leaked through promotional posters sent to card shops, with official images replacing their placeholder equivalents on the Japanese portal soon after. The promotional posters also advertised Legion as a new mechanic, each showing off two new cards united by the same crossing of swords symbol used in Legion Mate's official logo. Moreover, a set of promo cards have given some indication of what the new mechanic may look like. 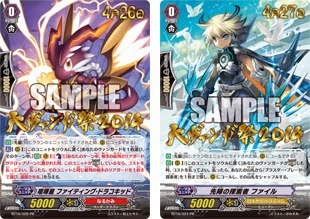 Set to be released on April 26th and 27th as part of this year's Great Vanguard Festival, the promos are new first vanguards for for Narukami and Royal Paladin intended to work alongside the trial decks' new cards. In addition to their basic Forerunner skills, Brawler Fighting Dracokid (喧嘩屋 ファイティング・ドラコキッド) and Vanguard Seeker File (先陣の探索者ファイル) have Legion-centric skills. 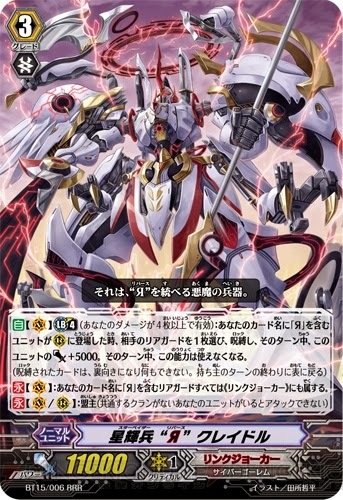 File's skill activates automatically; when the vanguard gets "Legion" he can move into the soul to superior call a Blaster Blade Seeker from the deck. Dracokid instead has to be activated in the main phase. By moving into the soul, Dracokid gives the vanguard a skill that when an opponent's frontrow rearguard is put into the drop zone and the vanguard has "Legion," his fighter can counterblast 1 and retire an opponent's unit on the same column as the retired card. The way that these cards are worded defines Legion as a quality any unit can have or have taken away, like Twin Drive!! or Boost, but also specifies particular benefits for the vanguard receiving it, and these units also give Legion a specific icon in the shape of a shield made up of crossed swords like that shown in other promotional materials. Note that since neither promo card is subclan or clan dependent, they do not necessarily have to be used with Brawler or Seeker vanguards, or even units of the same clan. All they require is that the vanguard have Legion. 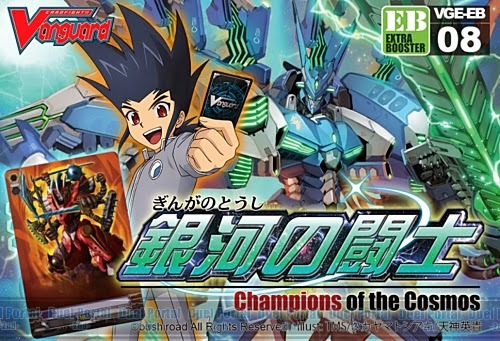 Currently it's presumed that Blaster Blade Seeker will have an on-call retire skill like past incarnations of Blaster Blade, and because File exchanges himself for a copy of Blade Seeker while Fighting Dracokid does not give anything but a retire skill, the cards are balanced around the idea that Dracokid causes the user to lose one card in advantage while the opponent's loses two where File does not cost card advantage and in exchange the Seeker he calls can only take away one card. If multiple retire skills can be triggered in one turn however, Dracokid can snowball more effectively by retiring two cards on his own in addition to what was accomplished with other skills. Furthermore, putting him in the soul can contribute towards Rising Phoenix's soulblast-to-draw skill. These extended combos specifically depend on being able to access other retire skills for less than 2 counterblast in the first place however, could not function with break ride skills due to the timing involved and can only last for a single turn. Accounting for how posters have advertised Legion as connecting two cards, the contiguous Blade Seeker and Sacred Wingal artwork, a similar design pattern for Skybeat and Skyhowl Dragon, and the literal reading of Legion's kanji 双闘 as "fighting as a pair," Legion itself seems to be built on the idea of tagging two cards together to work at once. Thus the mechanic both enables the abilities of certain cards as with File and Fighting Dracokid, and can be made useful on its own. The fact that Legion has to be received to use it at all suggests that there are restrictions on when and how many times a unit may get Legion per game. In international news, the upcoming Team League 2014 has had some of its terminology modified. What were previously identified as national championships are now being called regional championships, and what were called regionals are now being referred to as continental championships. This answers some of the confusion surrounding the idea that League 2014 was previously touting, that the national tournaments for each country would serve as qualifiers for regionals, which to many veteran fighters sounds like a paradoxical inversion of the established tournament structure; qualifying for a smaller event at a larger one. With the change in terminology has also come the dates for the upcoming tournaments, with regionals picking up in April and lasting through July while the continental tournaments will be in July. Specific dates can be found on the official Cardfight portal. Team League 2014 is a triples format for the English-language Cardfight!! 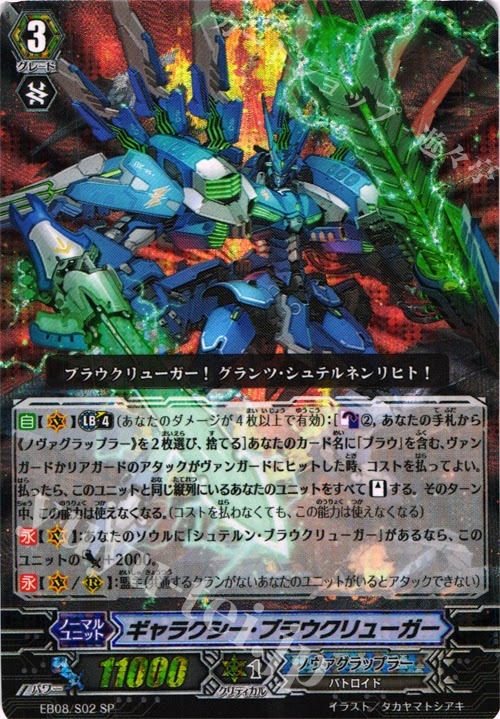 Vanguard TCG, with each team taking the side of either the Cray Defenders protecting the planet from attack or the Void Invaders seeking to conquer it with the otherworldly power of Lock and Reverse. Invader teams are required to play either with Link Joker or "Яeverse" cards empowered by the Void, while Defender teams are banned from using these cards and must fight back with their natural abilities. The results from Japan's most recent unofficial team tournament have been published, with team KHP winning the seventh Battle City Sakai VG Trio ChampionShip. KHP's members played a combination of the Blau series, Raging Form and Dragonic Nouvelle Vague decks, following the recent trends of Nova Grappler's rise among the established Kagerou and Shadow Paladin decks. Unlike past Blaukluger decks, KHP forward Gocchan's build emphasized the original Blaukluger as part of a crossride-centric strategy, shifting away from the focus on Mond Blaukluger that contemporary cardfighters have made, and away from the more aggressive break ride format in general. Team midfighter Tokumicchan has card-for-card emulated the deck of reigning national champion Lee Innyeng, importing its Claudas- and Blaster Dark-centric strategies and to some degree finalizing the decklist with his success. The seventh Battle City Sakai CS was held at 10:00 AM JST on the 16th, and conducted between 64 teams (192 persons) with an entry fee of 3000 yen per team. Each team member was required to use a different clan, but mixing clans within one deck was permitted. The first place team in the tournament received a voucher for an entire case (sixteen boxes) of VG-BT15: Infinite Rebirth, to be released in Japan on the 28th. Second place received a voucher for nine boxes of the set, while third received a voucher for six, and fourth for three boxes. The eighth Battle City CS is currently slated for March 21st. The Third Tachikawa VGCS also concluded just recently, with Link Joker cardfighter Shiimo taking first place against all odds. Since the rise of Nouvelle Vague and Minerva in the BT14-on format, Link Joker has taken a backseat to competing decks, with usage scaling back with each tournament until it now accounts for just under 6% of the total number of decks played at Tachikawa. This is a strong contrast to the West Tokyo CS of one booster set back, where Link Joker made up one-fourth of all decks played in the tournament. So while Shiimo's Chaos Breaker deck is familiar territory to many, the circumstances are not. The Revengers, Link Joker and Eradicators, which not long ago had dominated competitive play at the height of their shared era, have dwindled down to just 6, 5 and 3 decks out of the 86-person tournament. Kagerou and Genesis firmly dominated the third Tachikawa VGCS, building on a string of victories for the two clans. While Genesis is unanimously held together by the Sacred Regalia series led by its restanding grade 3 Artemis and on-soulblast superior call units Chamomile and Melissa, Kagerou is divided between cardfighters playing Dauntless Dominate Dragon “Яeverse” and those using the grade 4 Dragonic Nouvelle Vague. Nouvelle's future was uncertain after the keystone first vanguard that enabled its easy Nouvelle Roman plays, Lizard Soldier Conroe, was restricted last January, but after its success in the Kansai VGCS general confidence in Nouvelle has been restored. Like faruke's Nouvelle deck before them, Shiimo and his fellow top 8 Nouvelle cardfighters were using 4 copies of Calamity Tower Wyvern to make effective use of their soul and counterbalance the loss in consistency from Conroe being hit. Contrast this with Ucchii from the seventh Battle City CS, who played a more conventional deck that ignored the core issue altogether. In a moment of self-aware humor, the Tachikawa CS homepage listed the Nouvelle Vagues in Tiisupin and Rabbit's decks as grade 3s--not a hard idea to grasp, considering that with the supporting grade 1 Roman in the format, this is how the majority of Japanese cardfighters have treated Nouvelle both before and after Conroe's restriction. In our final story for tonight, the comprehensive rules for the English edition of the Cardfight!! Vanguard TCG have been amended to officially define Lock and Unlock. The most important definitions provided are that Locked cards are not treated as the same cards as they previously were, they do not have a defined stand or rest position but always Unlock as stand, and that the circle they are on is also modified into a separate type of circle. For more thorough information, see relevant sections 10.1.21 and 10.1.23. Illustration: Yamazaki Nanae, Sekiyama Konomu, Ebira, Tanimeso, Kawasumi, Ririnra. As part of his coverage for the upcoming Great Vanguard Festival, Doctor O has revealed the next issue in the Fighter's Collection series of boosters, VG-FC02: Fighter's Collection 2014. Stated to support all of Cray's clans with new RRR-print grade 3s, the set will go on sale on May 2nd, coincidentally on the same day as the international release of Catastrophic Outbreak. According to the Japanese Cardfight portal, this entry in Fighter's Collection will support "all 23 clans" with exception given to Etranger. Like in the upcoming EB10, Bermuda Triangle units will have both black and white prints of the same card, with different artwork. Most interestingly, the recently-unrestricted Majesty Lord Blaster is explicitly stated to be reprinted in the set, both on cf-vanguard and by Doctor O, and will be one of the Special Parallel prints for FC2014 in the same style of the 2013 set with golden calligraphy foil in place of its flavor text. Note that SPs in a Fighter's Colleciton set are considerably less rare than in standard booster sets, as there is an SP in every box rather than in every case of 16 boxes. Prior to its store date, boxes of this year's Fighter's Collection will be sold on-site at Vanguard Fest 2014 on April 26th and 27th. It will be priced at 3000 yen a box (approx. $30) and each pack will contain 10 packs. The March issue of Monthly Bushiroad was released in Japan yesterday, timed to coincide with the live airing of a crossover conference between Neppu Kairiku Bushi Radio and Monthly Bushiroad staff. While this most recent issue is concerned with the remaining RRR rarity cards for VG-BT15: Infinite Rebirth, it also covered information on the upcoming 3DS game, Cardfight!! Vanguard Lock on Victory. Previews have shown that the player will be able to choose between ten different characters in the game, up from Ride to Victory's six. What kinds of protagonists the new characters are intended to be is unknown, as while preceding characters like Ryouta and Luna were "Hotblooded type" and "Dark type" all four of the new characters have only been collectively referred to as "New type." Caption: "No way this Naoki is!?" In keeping with previous trends, there are both male and female versions of each personality, with newcomers Kazuya and Erika representing one kind and Subaru and Rin representing another. During the game's original story the player will be able to go to any of the three high schools from the Link Joker chapter of the anime, Hitsue High, Fukuhara High, or Miyaji Academy. The player character will wear the corresponding school uniform, and unlike in RTV the player will be able to change their character during the storyline. Preview images have also shown the Hotblooded protagonist Ryouta, fighting a Reversed Ishida Naoki using a Vowing Saber Dragon deck. Lock on Victory's original storyline will apparently feature the Reverse subplot from the anime, but as the player themselves will be able to use Link Joker and Reverse cards from the real-world boosters sets, it's unknown just how the storyline will flow. Lock on Victory will also feature ten new trial decks, making more options accessible to the player from the beginning of the game. The names of these game-unique TDs have been translated below. Two of Lock on Victory's protagonists made a recent cameo in episode 158 of the anime, with Luna and Ryouta wearing Hitsue and Miyaji uniforms. Although most promotional materials for the game have focused on Miyaji, Luna has now been shown wearing each of the three schools' uniforms, Fukuhara during the initial LOV conference, Hitsue in the anime, and Miyaji in Monthly Bushiroad. In other news, the third Tachikawa VGCS has just come to a close, with Link Joker and Nouvelle Vague cardfighters take first and second place. Tournament organizer Kohaku reported that in spite of the bad weather--the Tachikawa area saw snowfall throughout the 8th--the CS still saw 86 participants attending out of their projected 96. Third and fourth place went to Nouvelle and Minerva cardfighters respectively, while fifth through eighth to another Nouvelle fighter and two Blaukluger players. Decklists are expected to go up within the week. The official English portal for Cardfight!! Vanguard has updated with information on the upcoming 2014 team tournaments, "Team League 2014: Invasion." The Invasion is slated to begin in April and last through July; the current schedule states that nationals will start before regionals, but appears to rely on a different definition of "national" and "regional" championships. As defined further down, placing first or second in the national tournaments will qualify the teams for regionals. Taking place after the release of VGE-BT13: Catastrophic Outbreak in May, the Invasion's special rules will deliver a more immersive game experience by dividing participating teams into the Cray Defenders and Void Invaders, and the outcome of their battles will determine whether Cray is overtaken by the forces of darkness or if the soldiers of Link Joker are successfully repelled. As in Team League 2013 players will form teams of three to participate in triples fights, and each team member must use a different clan. However, the Invasion ruleset regulates teams more heavily than they were in the preceding team tournaments, drawing clear inspiration from Japan's New Years 2014 tournament. Cray Defender teams cannot use cards from the Link Joker clan or “Яeverse” cards in their decks, while Void Invader teams may only use Link Joker or decks with 3 or more “Яeverse” cards bearing the same name in them. A special rule allows Royal Paladin cardfighters on the Cray Defender side to use up to 10 Shadow Paladin cards in their decks, making a provision for Majesty Lord Blaster cardfighters. Each team member will receive a corresponding button as a participation prize, identifying them as a Defender or Invader, although team alignment will not be taken into account when determining round pairings. Which players fight which is determined by a team member's number. Each member is assigned either 1st, 2nd or 3rd position, and they are paired against opponents of the same number on the opposing team. This is similar to the Japanese team tournament structure used from 2011 to 2013, where players were assigned to be 先鋒 senpou "Foreward," 中堅 chuuken "Middle player" and the 大将 taishou "General" which have similar meanings, but also have double meanings like "Vanguard" for the Foreward and "Team Captain" for the General. Unlike in Teams 2013, there will be no shop qualifiers. Currently there are national championships scheduled for the North American, European and Asia-Oceanian territories. The initial rounds of each tournament will use a modified Swiss, double elimination ruleset where if an entire team loses two rounds they are eliminated from the tournament, with each round being best of 1 games, followed by a cut to top 8. Top 8 will be single elimination but best 2 out of 3 games. This is an important development as previously best of 3 was reserved for continental and international-level events, and starting with League 2014 it is being implemented at lower levels. The winning team will receive the Team League 2014 national champion's trophy, a corresponding certificate, and an invitation to their respective regional championship finals, while the runner-up team will receive a second place certificate and an invitation to the regional finals. For first place travel accommodations will be provided, except for players from the United Kingdom and Singapore. There will be no entry fees for the Invasion's qualifiers, except if the venues themselves charge for entry because of the tournament being held instead of another event. Even stars give up. The existence of life, production of energy and the expansion of the universe are not sustainable. Over time the strain of existence wears the stars down, their fuel is consumed, and the star collapses. What remains of that star is a ring singularity, with all the mass and gravity of its original identity, but capable of grand destruction in place of grand creation. The star becomes Reversed. This is the same principle by which the fundamental nihilism of the universe expressed as Void takes the souls of units, fighters and civilizations. In a bid for the systematized elimination of all light and living things, the clan from beyond the stars Link Joker acts as Void's emissaries, its arms and legs that seize planets to become pieces in the greater image of the profound darkness. Link Joker is thus a clan about being a good void; one that consumes and devours infinitely. To understand Link Joker, you must understand the their ability to devour, the clan's definitive mechanic, "Lock." A Locked card is turned face-down, rendering it completely unusuable, and is no longer treated as a rearguard. Consequently, Locked cards cannot be retired or have new units called over them. The clan of a Locked unit is also negated in the process, so that Locked units effectively cease to exist but prevent their rearguard circle from being used. In this way a destructive strategy is created that breaks the rearguard circle, preventing units like Alfred from drawing power out of those circles, while also stopping those rearguards' skills from being used and obstructing attacks. However, the power of Lock is finite. At the end phase of the owner of the Locked card's turn, the Lock will open and the unit will be released, so the skill is not as permanent as the straight retire abilities of clans like Kagerou or Narukami, but if played well it can be even more effective to destroy rearguard-centric decks and mitigate the attacking power of other strategies. The definitive Link Joker decks are all based on a mix of cards from TD11: Star-vader Invasion and BT12: Binding Force of the Black Rings. The clan also has a number of good promotional cards that either directly upgrade existing builds or provide alternative play styles. First among these is Dust Tail Unicorn, the clan's default first vanguard and one of the best grade 0s in the game; for counterblast 1, Dust Tail can move into the soul and Lock an opponent's rearguard if they already have a Locked rearguard. The immediate exchange is neutral, losing one of your own cards to take away the opponent's, and when the opponent's rearguard Unlocks it will be a negative exchange on your end of the field because their rearguard is preserved, but this is a good time to elaborate on what the exact advantage of Lock is. If Dust Tail is used to Lock a frontrow rearguard, this conserves shield in the next turn because instead of dropping 10000 shield to stop a boosted rearguard attack, you trade in a card that is already given to you at no cost. The impact of Lock is increased if the opponent drive checks any triggers, because a key turn for them has been nullified since there are no rearguards to give the triggers to. Instead of guarding a possible 21~26000+ power attack, you prevent it from happening in the first place and lose one card instead of two or three. Ergo, the innate advantage of Lock is conservation. You should plan accordingly to prioritize frontrow Locks rather than backrow, as a backrow Lock only stops an attack from being boosted, but a frontrow Lock stops it altogether. Star-vader Invasion is where this clan gets its foundation from, and the deck's exclusives should all be picked up as singles even if you don't get the trial deck itself. Infinite Zero Dragon is the black and white key from which all of Link Joker extends; this card is the crux of good Link Joker decks and a playset is absolutely necessary to play the clan competitively. Infinite's Break Ride skill gives the vanguard the standard +10000 power and Locks a frontrow and backrow rearguard on their field. This has no counterblast cost, and while Infinite does not refund the -1 taken from riding an extra grade 3, it also gives the opponent a temporary -2 to conserve approximately 10~20000 shield. By Locking the opposing vanguard booster and one of the frontrow rearguards, Infinite comes more than halfway to achieving Link Joker's ideal field setup, and Dust Tail can complete it. Since Dust Tail has no frontrow or backrow restrictions, it can easily complete the strategy by Locking the remaining frontrow unit. By executing this strategy, both rearguard columns are prevented from attacking for a turn while the vanguard can only swing independently, a feat that only specific one-man army units and other break rides are really able to measure up to. This is while Infinite attacks them in the range of 23~31000 power and makes specific combos with cards from BT12, forcing the opponent to drop more cards for one turn while you conserve on theirs. This provides a breather turn after you've hit limit break to stabilize your position and capitalize on these characteristics as much as possible to try and snowball the effects of Lock. This is where their other primary grade 3 comes in. 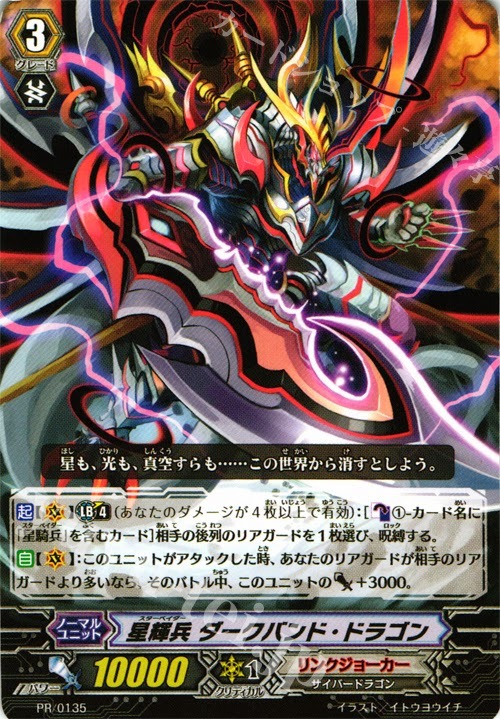 From BT12, Nebula Lord Dragon is the commander of Link Joker's advance guard, the Star-vaders. His counterblast 2 is restricted to Locking an opponent's backrow unit, but the real attraction of this card is his limit break, a continuous skill that gives all frontrow Link Joker units +3000 power for each of the opponent's Locked cards in play. Comboing this with Infinite Zero, that's a +6000 power boost that will easily put Nebula in the 17~22000 power range depending on his booster, and rearguard Star-vader attackers at 18000 power before boosting. If Dust Tail is factored in, you can have the perfect field Lock of left and right attackers along with the opponent's vanguard booster for a +9000 boost to the front row. With the clan's standard grade 2 subclan attacker, Unrivaled Star-vader Radon, you can add this to a 12000 power swing to make 21000 power rearguard columns and with any kind of reasonable booster Nebula Lord himself will be in the range of 26~28000. Realistically speaking however, the three Lock ideal is out of reach. It's more practical to save Dust Tail for the next turn, using Infinite's break ride to Lock 2, and then when that turn does come around use Nebula Lord to Lock the vanguard booster and greenlight Dust Tail's skill to Lock a frontrow unit again. In general the number of turns you can prolong a series of Locks are more important than the quantity of units that you are able to Lock. Nebula Lord also has specific combos with BT12's grade 2 and 1 units, Evil Claw Star-vader Niobium and Demonic Claw Star-vader Lanthanum. These are base 9000 and 7000 units that each get +2000 power when a card is Locked. These skills will stack with Nebula Lord's, so that in the Lock 2 example a Lanthan boosting a Niob will together swing for 30000 power, and it also gives Lanthan a specific combo with Radon where in that same example Lanthan's 11000 power and Radon's base 12000 with Nebula Lord's +6000 limit break would make a 29000 power line, functionally the same in the BT10-on format where base 10000 vanguards are rare. For these reasons Niob and Radon are frequently interchangeable on the frontrow, but protecting Niob on the opponent's turn becomes a priority, since it's beneficial for them to try and destroy Niob before Infinite Zero's break ride skill can go off. We've already established that the innate value of Lock is conservation, but conservation by itself is not a game determining effect. What makes Link Joker dangerous is not Lock, but all of the extraneous effects that can be derived from it through limit breaks. Nebula Lord is only the first of many, specifically using it to bring out pure force, but what should be apparent here is that by himself he can only carry that power boost for a single turn. Past a certain point in the game, if you cannot do something every turn, it is rarely worth doing at all. So Link Joker's secret is that the clan wants to keep riding Infinite Zero for as many turns as possible, prolonging the effects of Lock, swinging with three rows for ~23000 power while the opponent is restricted to using half of a vanguard column and one rearguard line, and go into Nebula Lord for the endgame only when there are no Infinites remaining in hand. The entire stability of Link Joker prior to BT13: Catastrophic Outbreak rests on Infinite Zero Dragon, so you should plan your deck accordingly. Link Joker is a slow, late game centric clan which needs to go through as many cards as possible to gather as many Infinites as possible, and this is part of why its initial reception in Japan was so lukewarm. To set up its gameplan effectively, running between five and seven draw triggers with seven or fewer critical triggers will help you go through more cards and slow the opponent down with defensive checks. This is supported by the results of the 2013 tournament season, where the 5~7 draw concept was effectively proven at FC2013 Tokyo, July 2013 Fateclock VGCS, and Chiba VGCS. Based on this history, six draw is a recommended start for BT12-on. The opposing side of Nebula Lord is that while the deck is very dependent on Infinite, it's also one of the more enduring Link Joker builds. Even with the eventual introduction of unlock skills that can break the clan's spell, the fact that everything Nebula and Infinite are trying to do is happening inside of their own turn means that there is no hard counter to the massive power boosts they can bring into play. Dismantling Lock only cuts out half of their strategy, while the remaining half could easily carry a deck on its own. For supporting units outside of standard subclan attackers and units that power up by Locking cards, you should consider the grade 2 Star-vader Mobius Breath Dragon, another of the trial deck exclusives. Mobius Breath can only Lock one of the opponent's rearguards when his attack hits and he's also on the vanguard circle, but this midgame Lock is considered extremely valuable because it can either disrupt the opponent's strategy by taking one of their boosting or attacking units out of play and let you conserve more early on to slow down rush decks like Spike Brothers, or counter first vanguard skills like Linchu and Wingal Brave. If the opponent is running grade 3 searchers this can even cause them to become gradelocked, and it will also trigger Niobium's skill for early game attacks. Even if the opponent defends the attack, since Mobius will strike in the range of 14~16000 power after boosting it becomes a situation where the opponent cannot win since they're forced to either permanently give up cards earlier by guarding while reaching limit break more slowly or have their strategy disrupted. There is a lot of room to doubt what's otherwise an unskilled 9000 power unit outside of these specific scenarios, but like the 5~7 draw strategy Mobius has been repeatedly proven in VGCS tournaments. The card is generally recommended to be run at 3 copies. Outside of the mainstream Link Joker deck, there are several alternative builds available. Dark Band Dragon is the other Star-vader boss card standing opposite Nebula Lord in that it's a more strategic deck, benefiting from the same base of support but with a different end goal. 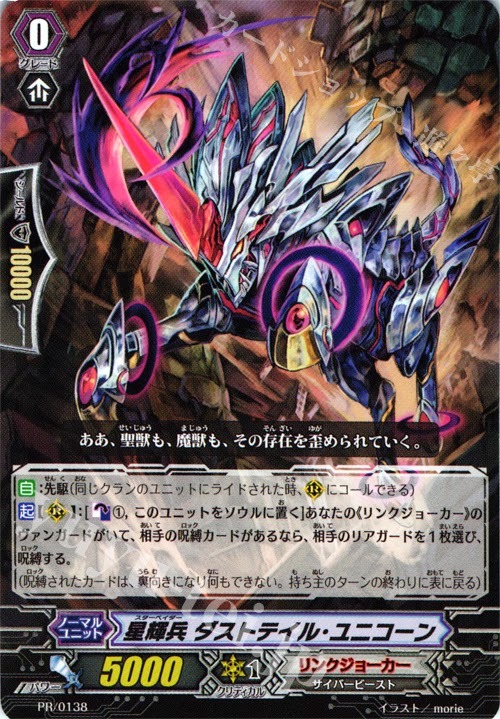 As the prototypical Link Joker grade 3 introduced early on in preview material and released in English ahead of the other cards by way of promo packs, Dark Band sits at a lower 10000 base power but gets +3000 if you have more rearguards than the opponent, which with their base 8000 grade 1 Binary Star can make for a very simple 21000 line, or with Aurora Eagle who shares his activation conditions Dark Band can get a total +10000 power boost and swing for an anticrossride 23000. The way that Dark Band fuels these skills is with his limit break, counterblast 1 "Star-vader" to Lock one of the opponent's backrow rearguards. Because cards that are Locked do not exist, filling your own field while Locking even one of the opponent's rearguards will activate these conditions and happily coincide with Lanthan and Niob's skills. Since Dark Band Dragon's especial counterblast is a cheaper cost overall, and as a Star-vader Aurora Eagle can easily replace the non-Star-vader Binary Star in the deck, you can easily build a pure Star-vader deck focused on Infinite Zero into Dark Band to continually Lock the opponent's rearguards and activate those power up skills, using multiple break rides as in the Nebula Lord deck and when they wear off going for Dark Band into Dust Tail. For the final endgame, Dark Band can CB3 to Lock the entire back row, greatly weakening the opponent at a crucial point in the fight. This strategy loses the supplementary power boost that makes the Nebula Lord build so definitely strong, but the only specific setback it faces in comparison to that card is falling harder to the unlock skills of BT14-on. Outside of the Star-vaders, Link Joker's options are presently limited but not without merit. Knight of Entropy is the clan's Garmore clone, a base 10000 grade 3 vanguard with a +5000 power on-attack limit break, and his counterblast 2 Locks one of the opponent's rearguards to achieve card advantage rather than pull cards from the deck like preceding Garmore-type units, which does give you more room to repeatedly ride Entropy without a reprising loss in advantage even though this is a very limited means of controlling the field and will generally only happen twice per game once Dust Tail is accounted for. 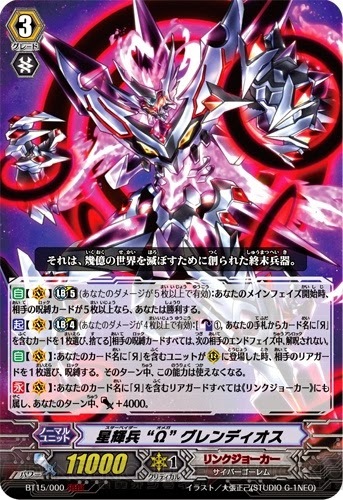 A more alluring grade 3 is Schwarzschild Dragon, their second RRR and clanwide boss card. As the original enemy to contact Cray and the one who sealed the three heroes, Schwarzschild has a suitable base of support to work off of. 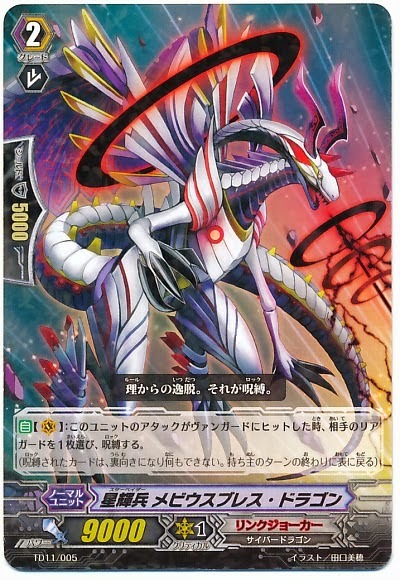 This Cyber Dragon is the key grade 3 for Link Joker's evolving ride, and comes with all the trappings of third season-era card evolution; instead of Dust Tail Unicorn, the Schwarzschild deck uses the base 4000 Microhole Dracokid as its first vanguard. There are benefits to using Dust Tail with the build, but we'll get into why it's difficult to use something other than Microhole in a bit. By riding the grade 1 Gravity Ball Dragon over Microhole Dracokid, you can look at up to seven cards from the top of the deck for either Schwarzschild or the grade 2 Gravity Collapse Dragon. Even if you can't find Gravity Collapse, as long as you can ride another grade 2, his skill will search another seven cards for Gravity Collapse and try to superior ride the card. Since Link Joker doesn't make use of many soulblasts, it's not as beneficial as in Genesis, but the real benefit to riding Gravity Collapse is that as long as the corresponding grade 1 and 2 units are in the soul, you can Lock any of the opponent's rearguards. The guaranteed Lock is an improvement over Mobius Breath, but the skills are fairly incomparable because Gravity Collapse does not have the same properties of a high-pressure midgame swing, instead shutting down one part of the opponent's turn outright. This is also one of the reasons that running Dust Tail in Schwarzschild is difficult. Gravity Collapse is necessary for Schwarzschild to become a base 11000 unit, and you would naturally want to use Gravity Collapse's skill to take maximum advantage of the deck's characteristics, but this requires both the grade 1 and grade 0 to pull off. VG-BT13: Catastrophic Outbreak introduces cards that can allow for both to be used, but for the time being Microhole is the recommended first vanguard. 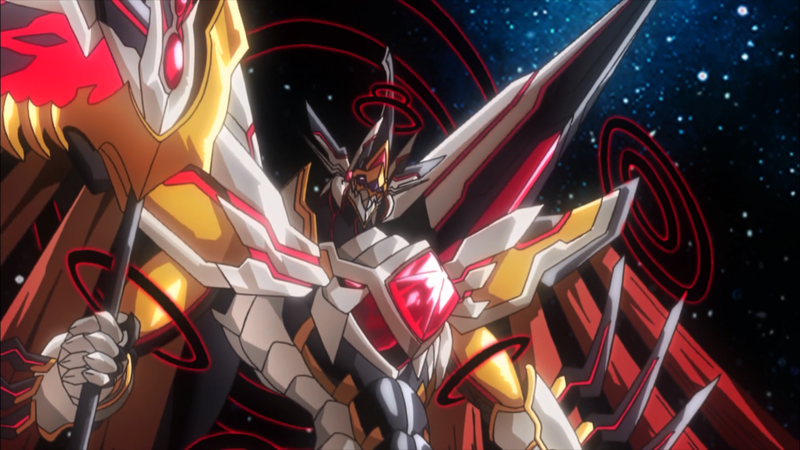 Finally, Schwarzschild Dragon itself is the mastermind behind the Liberation War and the one who originally sealed Blaster Blade, Blaster Dark and Dragonic Overlord. His skills are appropriately powerful. 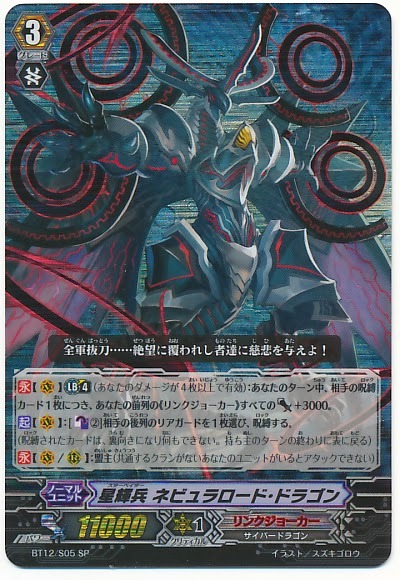 Schwarzschild is the only Link Joker capable of Locking three of the opponents' rearguards simultaneously, achieving the ideal gameplan of shutting down both frontrow rearguard circles and the vanguard booster. The catch is that his cost ensures that this is only a once per game play. Counterblast 3 is not so hard to pay in a dedicated Schwarzschild deck because he is the only card in the deck that uses counterblast, but you also have to persona blast to do so, necessitating a second copy of Schwarzschild to already be in hand. If you don't already have it, Schwarzschild has a supporting on-ride skill that lets you look at up to five cards from the top of the deck for a copy of him for just counterblast 1, and this combined with Microhole makes getting that second copy in hand much easier. The most important aspect of the card is the timing of the persona blast; to make the most of Schwarzschild, it's best to repeatedly break ride Infinite over Infinite to power up Lanthan and Niob for several turns, then on the turn after you've finally ridden Schwarzschild and the opponent's Locks have come undone, use the persona blast to make them go through a turn of zero resources. Since as a bonus the skill gives +10000 power and +1 critical to the Cyber Dragon, and the Lock 3 will give his supporting rearguards +6000 power, this forces the opponent to drop in the vicinity of 6~9 cards at a point when they should already be starved for resources from guarding intense earlier attacks, Schwarzschild's limit break is a skill that gets stronger the later in the match that it is used. The card rewards patience and utilitarian play. If you are forced to ride Schwarzschild before Infinite, it is better to try and re-ride into Infinite Zero and see if you can't get two of the remaining Schwarzschilds later on than it is to try to go all-in with the persona blast early. None of the Link Joker builds rush in the way that Spike Brothers or Nova Grappler can, and in fact their slowness in the BT12 format is their primary weakness alongside their general lack of a late game plan if resources are squandered. You need to be acutely aware of the fact that once Schwarzschild's persona blast has gone off, that no more skills will activate for the rest of the game after that point. The costs for Link Joker's Black Shield are designed to be easy to pay so that the cardfighter that can pace themselves will have an advantage over the fighters that cannot. Overall Link Joker is a strategic midgame deck that can fight with explosive power on key turns, but is greatly hindered by the lack of active skills prior to turn 4, overdependence on Infinite Zero Dragon to base its strategies out of, and not being able to strike back effectively against early aggression. The clan rewards veterans and studious cardfighters who understand the characteristics of each deck as they face it, to know which rearguards are important Lock targets and how different boss cards can respond to the loss of their field. There is good reason that it took so long for it to catch on in its native country, but continued to endure to this day once it had. Later sets will revise Link Joker's strategy to counter some of its more serious weaknesses while introducing both alternate play styles and legacy support for the older decks; and for now, the invasion begins February 7th.